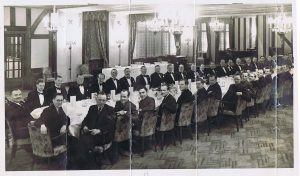 One of the oldest customs of the Officers’ Mess is that of dining-in, ostensibly to drink the loyal toast, and for 100 years the Members of the No 46 Squadron Association have, wherever possible, used this format to celebrate the unique spirit of the Squadron. The proceedings begin about 1 hour before the hour appointed for dinner, normally 8 pm, when all Members, their ladies and their guests assemble in the anteroom for pre-dinner drinks and canapes. The Members and their guests circulate as much as possible in the best tradition of friendliness and hospitality. During these pre-dinner drinks the ‘HEALTH AND STRENGTH’ is prepared during which the rather improbable and quite untrue cry of ‘Shhhhhhhh ONE, TWO, THREE, Cheerio 46, First Today!’ will be loudly echoed by all Members. 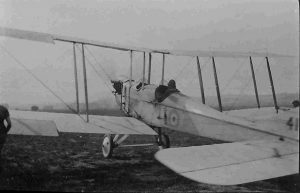 ‘HEALTH AND STRENGTH’ is the energy-giving libation that fortified Squadron crews prior to the Dawn Patrol in the First World War. 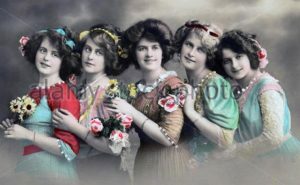 Just before 8 o’clock the Ladies will leave, the gentlemen should take this opportunity to check their position on the seating plan and it may be advisable to ‘ease springs’. After the Mess manager announces ‘Dinner is Served’, Mr Vice leads the assemblage into dinner. If a band is in attendance the Mess manager’s announcement may be preceded by a trumpet fanfare followed by the playing of ‘Roast Beef of Old England’ as the Members go into dinner. Once in the dining room, Members stand behind their chairs, keeping talking to a whispered tone. The last to arrive will be the President and the senior guest. The President then bangs his gavel and asks a Member to say grace; he will then call upon everyone to take ‘HEALTH AND STRENGTH’. Members and their guests stand on their chairs and place their LEFT foot on the table. Following the toast of ‘ONE, TWO, THREE, Cheerio 46, First Today’ the concoction is drunk in one go. Although the drink is rather pleasant it is customary to make some derogatory remark about it! Following this unbecoming display, everyone takes their seats. Normally, the first course will be on the table, so Grace having been said, the meal may begin. However, the custom is that Members should not start any course before the top table, which takes its cue from the President.The stewards will only clear away empty plates when the last Member has finished. At a “real” Dining In Night it is considered most undignified to leave the dining room while dinner is in progress, but in view of the advancing age of Members it is acceptable to leave during the meal but with discretion. 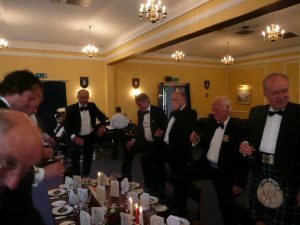 No 46 Squadron has a long and unique tradition whereby any Member may ‘take wine’ at any time during the dinner; he does this by banging the table, standing up and announcing “I would like to take wine with all those who ….. e.g. flew Javelins, drank in Rosies Bar” etc. Members who accept the offer rise and toast each other. It is perfectly acceptable to applaud the Band but this should be done sparingly and with restraint. At the conclusion of the meal and before any speeches, the Mess staff will clear all plates and glasses other than a port glass. A decanter each of Port and Madeira is then positioned in front of the President and Mr Vice. When the President removes the decanter stoppers, Mr Vice does likewise. The President and Mr Vice then pass the decanters to their left. Each Member then charges his own glass to taste. A steward will be in attendance with a jug of water while the Port is being passed for those who prefer a non-alcoholic drink. Eventually the President’s set of decanters will reach Mr Vice, and Mr Vice’s the President, the stoppers are then replaced. (The decanters should never be passed back to the right). Extra decanters will be placed at regular points around the tables and it is important that these extra decanters are handled in the same way. 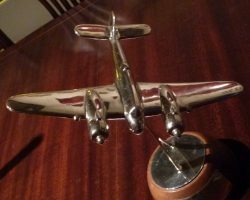 The tradition that the decanter should not touch the table until it reaches its final destination is obscure and is not followed by No 46 Squadron. The stage is now set for the loyal toast. The President bangs his gavel and proclaims: “Mr Vice – The Queen”. Mr Vice then rises and replies: “Gentlemen – The Queen.” The assembly rises, and if a band is in attendance the National Anthem will be played. On completion of the anthem, glasses are lifted “The Queen” is repeated by the assemblage and the Port sipped. Seats are then resumed. If there are Members or guests from foreign or Commonwealth countries, toasts will be proposed to their head of state. The President will rise and propose the toast, for example, “Mr Vice – The President of the Federal Republic of Germany.” Mr Vice rises and replies: “Gentlemen, The President of the Federal Republic of Germany”. Again, all will rise, if a band is present it will play the appropriate anthem; otherwise, Members lift their glasses and repeat the toast. If a band is present then, after the loyal toast, the President will ask the band masters to join him and the Chef for a glass of port; this intended as a token of thanks on behalf of the Members. On completion of the loyal toast, coffee is served and the President recommences the circulation of the Port and Madeira decanters. He will then bang his gavel, rise and announce, “Gentlemen you may ease springs” he will also announce when members should return to theirs seats. Members will generally have had no need to touch the Mess silver during dinner; indeed a Member may be fined for so doing. However, if he has a burning need to read a particular inscription, it is generally permitted to touch the silver after the Loyal Toast. Members who take advantage of the break must return to their seats with alacrity. 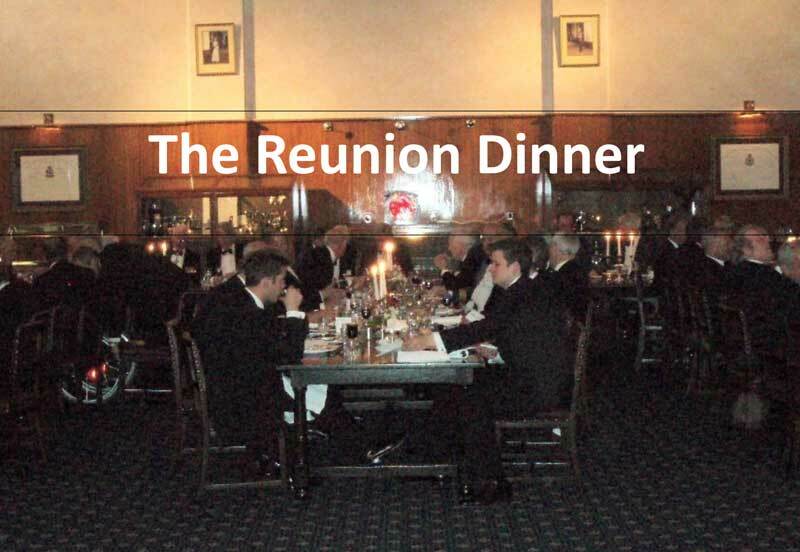 On the return of all the Members, the President will, in turn, call upon the Secretary to make the Parish Announcements and nominated Members to propose toasts to ‘The Squadron’ and to ‘Absent Friends’. At the end of each proposal, all Members rise and drink the toast, repeating the exultation. Finally, the President will propose a toast to ‘Our Guests’; only the Members rise and drink this toast. To indicate the end of dinner, the President will bang his gavel and stand, the top table will rise and, led by the President, leave the dining room. During the exit, the remaining Members stand until all the top table have left. Other Members may then leave the dining room when they wish and later rejoin their colleagues in the anteroom for postprandial refreshment and reminiscences. Bowdlerised and plagiarised from ‘Behind the Hangar Doors’ by Philip Congdon. 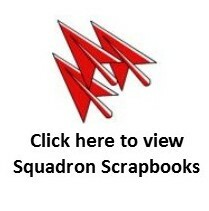 Sonik Books 1985.